Every now and then we venture out of Coral Gables when we discover some really special finds. This time we headed a bit north and met up with Cesar Gonzalez, restaurateur and social media tycoon. We have loved his creations at Bocas House so much that we asked him to share a recipe that you can all make at home. 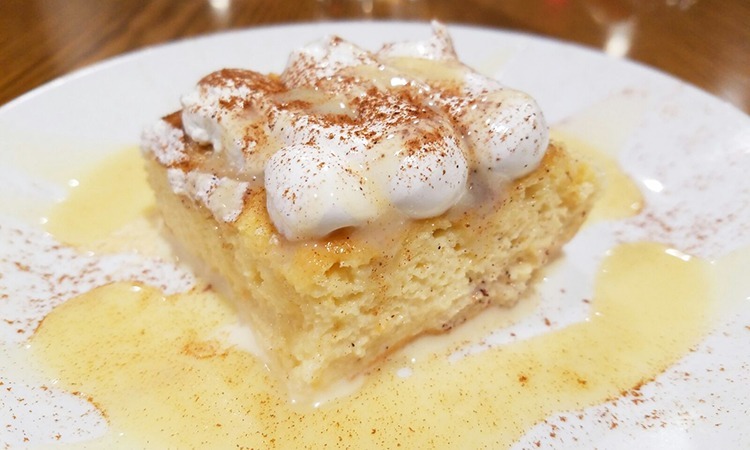 Today he is sharing the Torta Tres Leches (Three Milks Cake) to satisfy that sweet tooth. This dessert is served in many restaurants across Miami, but with these step-by-step instructions you can make it right in the comfort of your home. And if it comes from Cesar, you can bet it will be delicious! Preheat oven to 350˚F (180˚C) and butter the sides of a baking dish. Beat the 4 egg whites to soft peaks like snow, and gradually add the yolks, sugar, and the all-purpose flour. Pour the batter into the baking dish and leave in the oven for 20 minutes, or until it passes the clean toothpick test. Liquefy the heavy cream, evaporated milk and sweetened condensed milk. If you desire a sweeter cream, add more condensed milk to taste. Use a fork to poke tiny, evenly spaced holes into the cake, and then pour the cream over the cake. Now you are ready to decorate your dessert. You can make the meringue by whipping the 3 egg whites remaining and then adding the sugar little by little. You will see the texture of soft peaks start to change and become glossier. This is when you know it is ready. Chef recommends you leave it in the baking dish until it is time to be served. Once you remove it from the mold, you can scoop out some of the cream that has dripped out of your cake back on top of it. No ingredients were lost in the making of this Tres Leches. Spread the meringue over the top of your cooled sponge cake, sprinkle some cinnamon on it or even drizzle caramel sauce in a decorative pattern. Serve it to your loved ones all season long. It goes well with just about anything! His Instagram following on @co_cinero includes an engaging community of about 1.2 million. It is the result of more than 15 years of his specializing in Marketing & Sales where he has worked on projects from creation to market and design. He also thrives in the kitchen with creative projects, such as our favorites, like Bocas Grill and Bocas House. This Latin American eatery offers an expansive menu with a fusion of Venezuelan and Peruvian dishes. Cesar Gonzalez is joined by Chef de Cuisine Roberto Gonzalez to bring you flavors from their home. From fresh Ceviche to a creamy Mac and Cheese prepared with aji amarillo, and their selfie-worthy Tomahawk, there is something everyone can enjoy. And for more of that sugar-high, they bring out their ever so popular milkshakes that are stacked high with birthday cake, brownies, and even an ice cream cone! Find more recipes shared by Cesar Gonzalez on his Instagram here and drool over these creations from Bocas House by clicking here.